Enjoy a short video showing the excitement of coding! The second annual Hour of Code is here – celebrated the week of December 8 – 12! Last year, 15 million students around the world learned an hour of code. 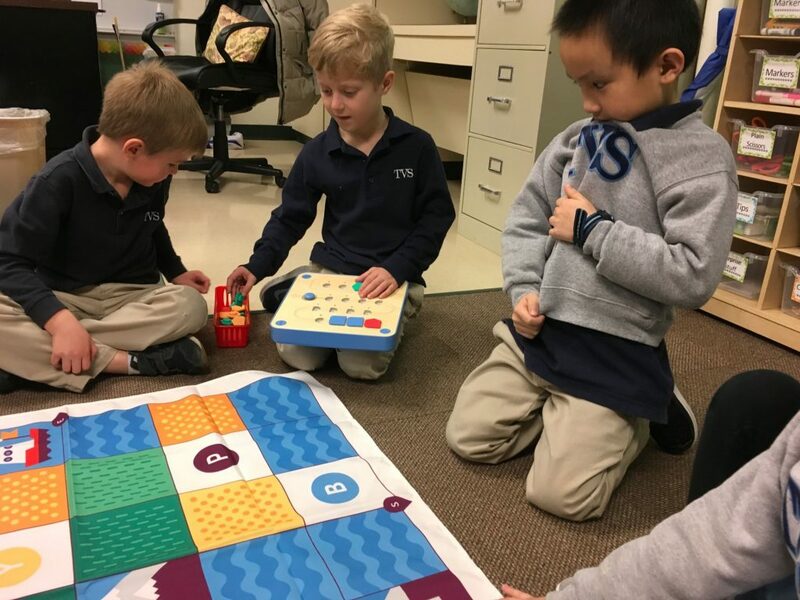 Kodable: K – 2 classes will log in to the Kodable app to learn sequence, conditions, and loops by dragging and dropping commands to program a fuzzy character. The app is free with in-app purchases. A school account was purchased for our younger students so their progress is saved. LightBot: The LightBot app ($2.99) is designed for ages 9 – 12. However, I’ve used it with younger children and it’s always a hit. 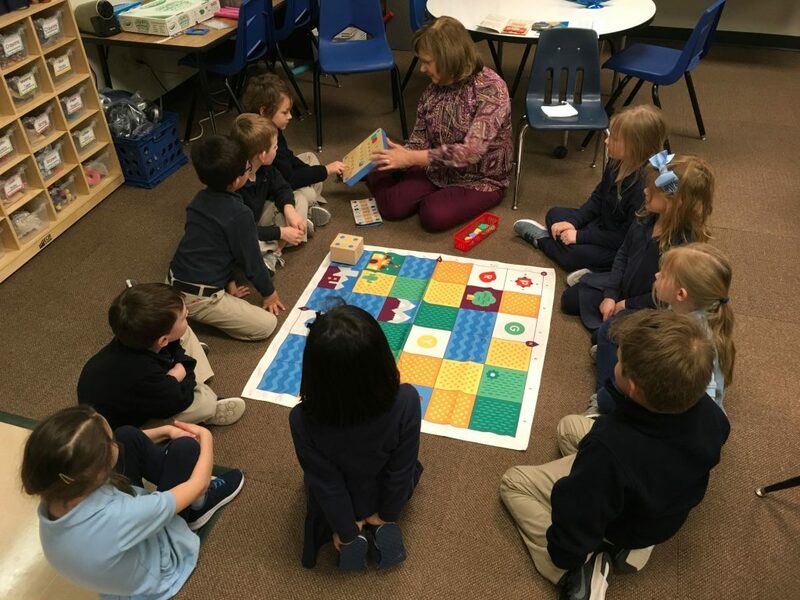 Students move the character to light a square by dragging and dropping commands. There is also a LightBot, Jr. for the younger children. These activities are just a few of the many resources available to help students of all ages experiment with coding. Since I work with elementary children, I’ll focus on those designed for this age. CodeStudio: Besides the courses available, there are special Hour of Code activities including Frozen, Play Lab, and Flappy Code. 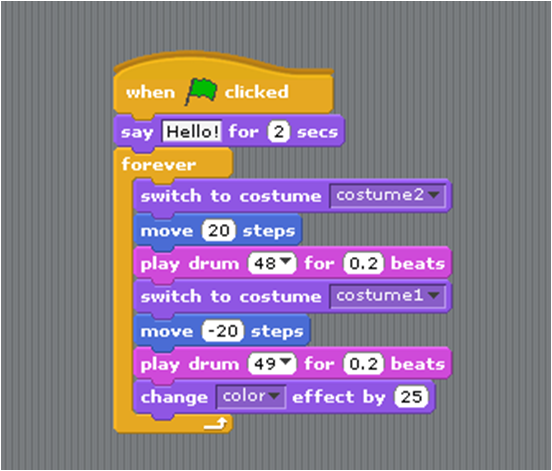 Scratch Programming: Snap blocks together to create games, interactive stories, and more. 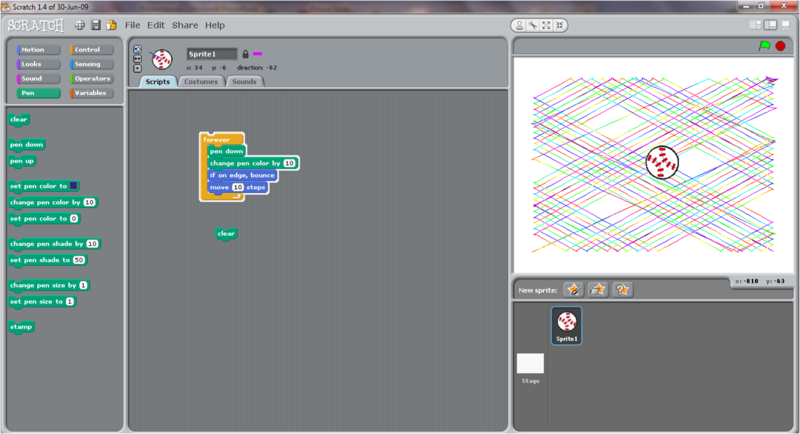 Tynker Hour of Code: Similar to Scratch with the snap blocks; Tynker also has an iOS app. Blockly Games: A series of games designed to practice coding (Use Safari, Firefox, or Google Chrome). Holiday Lights: Light up the White House Christmas tree by snapping coding blocks together (Use Safari, Firefox, or Google Chrome). As you can see, there are numerous resources available to learn coding. 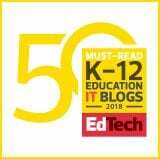 Learning coding helps students develop computational skills and problem solving. Coding is difficult but the students LOVE the challenge! Give it a try – your children will enjoy guiding you through what they know! What a fun and exciting day we had on December 11th as the entire school celebrated the Hour of Code! Here is a snippet of what occurred that day. As usual, I planned far too much for 15 minute periods! How could I really think that we could work with 3 or 4 apps in that short amount of time? (See previous post: Getting Ready for Hour of Code). But, that’s alright! The students had a wonderful time working with apps, online programs, and coding with cups during P.E. I loved watching the thinking processes that occurred as the students worked. You could almost see their brains spinning as they practiced how to solve each level! The collaboration among the students was fantastic. If someone was “stuck” another child quickly and willingly stepped in to offer guidance. The best part was watching the students help their teachers! I even had one teacher who apparently worked with the Cargo Bot app all day; giving up his planning periods to move up through the levels. He even searched for me after school to discuss it! Our coding day was a resounding success. My part was with Lower School but I know exciting events were going on in our Middle and Upper Schools as well! Enjoy a longer animoto video of the day. 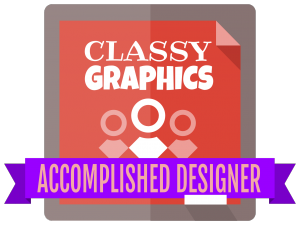 In May I discovered an online course – Creative Computing Online Workshop, (CCOW), designed and facilitated by members of the ScratchEd Team at Harvard University. 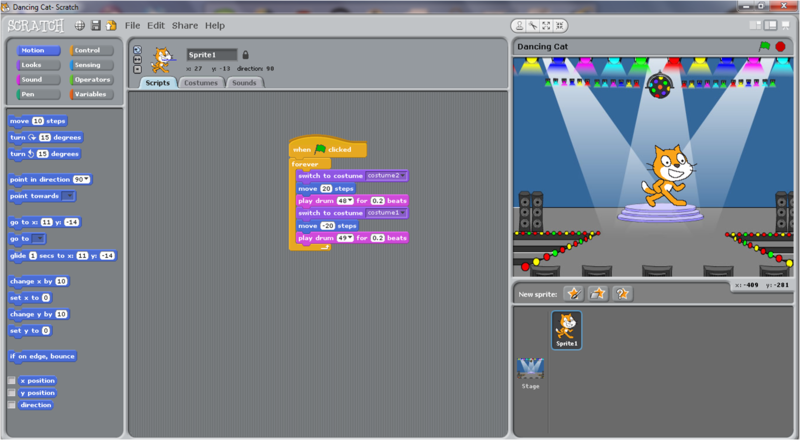 Over the past couple of years, I’ve been working with 4th graders on the very basics of Scratch, a programming language designed for ages 8 and up. However, the basics were about all I could do! One of my goals this summer had been to practice Scratch so when I learned about the course, I immediately signed up. 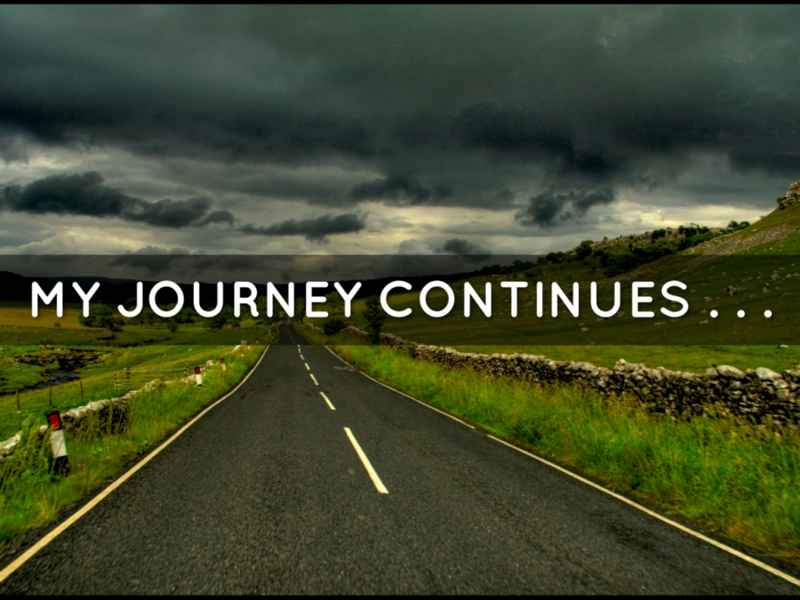 Back to the course – the workshop was 6 weeks long and well-worth the time spent! The first three weeks were fast and furious; learning more and more about the power of Scratch. 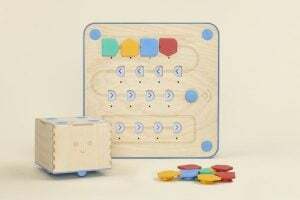 I quickly realized that, although this was a program designed for children, my non-analytical mind just couldn’t grasp everything as quickly as I’d hoped. At one point I became so frustrated that I was ready to quit! I’m glad I stuck with it! We were supposed to be looking at other design notebooks and leaving feedback and it was all I could do just to keep up with each week’s assignments. Fortunately, the ScratchEd team AND the CCOW community were absolutely fantastic! From the excellent how-to videos to the “office hours” to each week’s activities, the designers of this workshop guided us to the point where we were ready to create a final project to share with our fellow CCOWers. 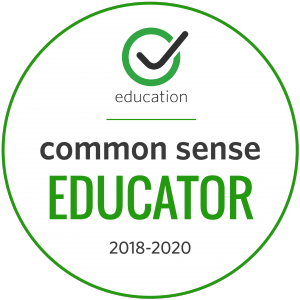 I can’t say enough about the community of learners! There were beginners all the way to expert programmers who easily created amazing Scratch projects! And, then there was me – plodding along, not able to figure out why something didn’t work . . . 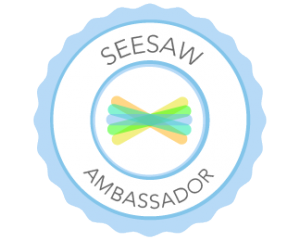 But my fellow workshop members were ALWAYS available to fix issues, answer my “why” questions, and offer guidance on how to feel more comfortable using Scratch. Throughout the six weeks, we kept a design notebook describing our thoughts, practice projects, and finally, our final project. Continue practicing Scratch projects. 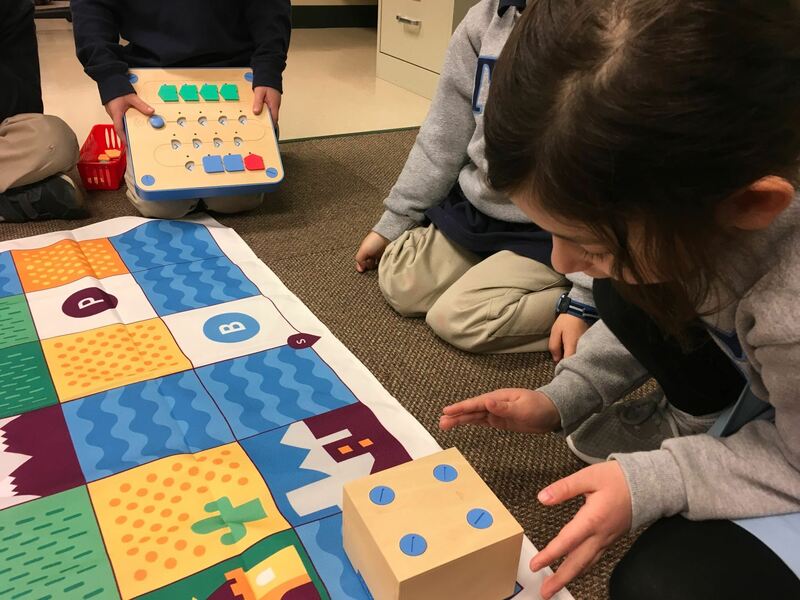 (I struggled with some projects that I just couldn’t get to work but I was particularly proud of a multiplication and addition game – thanks to lots of help from the CCOW community). 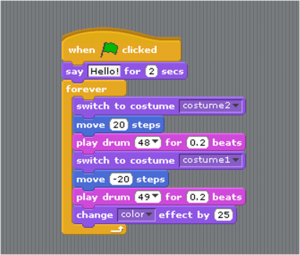 Collect resources and create a Scratch Resources LiveBinder. Make some new Scratch cards to use with my students. Although I didn’t progress as quickly as I’d hoped (As I mentioned before, programming baffles me! ), I am definitely further along than before taking the course. This was challenging but one of the most rewarding experiences I’ve ever had! I am excited to use Scratch again with my students and now feel that I can do a much better job guiding them to ask questions and problem-solve with each other. I did learn something important. Normally, learning comes easily for me but this time it didn’t. It’s important to share with children the struggles that occur in the learning process – how important it is to ask for help, to share ideas, to understand that sometimes you just have to step away for a bit, that learning is ongoing! This week, one class of 4th graders was introduced to Scratch, the programming language developed by the Lifelong Kindergarten at MIT. Scratch is intended for ages 8 to 16. The students had seen the link to Scratch in their 4th grade folders but I hadn’t said anything about it. A couple had already done some exploring and discovered they could draw things but hadn’t yet figured out that they could make the sprites move! So, when I mentioned Wednesday that we would learn about Scratch the following day, there was a good deal of interest. The next day I started out by having the students open Scratch then come to the floor to watch the following video. Upon returning to their seats, it was all I could do to keep the students’ attention as I tried to guide them through creating the cat to move! They were SO excited. We did some basic blocks (move 10 steps, forever loop, change costume) then I let them loose. They spent the next 15 minutes exploring and seeing what they could get their sprite to do. I felt like I had lost complete control but while watching them, decided they needed the exploration time more than they needed me talking! The next day, several of the students excitedly reported that their parents had downoaded Scratch at home. When others heard that, they wanted to know exactly how to find the program so that they could also get it. Everyone was eager to start class, so we began by building onto the dancing cat program started the day before by adding a speech bubble and a color change. Before letting them explore, I wanted to show the pen down block. Everyone chose a ball then we added the following blocks: move 10 steps, if on edge bounce, pen down, change pen color by 10, forever loop, and clear. The students experimented with how to make the ball bounce in various ways so that it didn’t always move in the same direction. The exciting thing about Scratch is how it draws in even the most reluctant learners. Everyone was eager to experiment with the sprites and the blocks. There was a healthy buzz as students offered suggestions to each other; lots of problem-solving going on!